Pence, the vice presidential elect and a Republican, was booed as he attended the show Friday night in New York. The cast had a message for Pence after the show as he was walking out saying, “We sir, we are the diverse America who are alarmed and anxious that your new administration will not protect us, our planet, our children, our parents or defend us and uphold our inalienable rights, sir.” President-elect Donald Trump on Saturday said the cast of the hit Broadway show “Hamilton” was “rude” to White House teammate Mike Pence and that he deserves an apology for being “harassed.” Trump said. “Our wonderful future V.P. 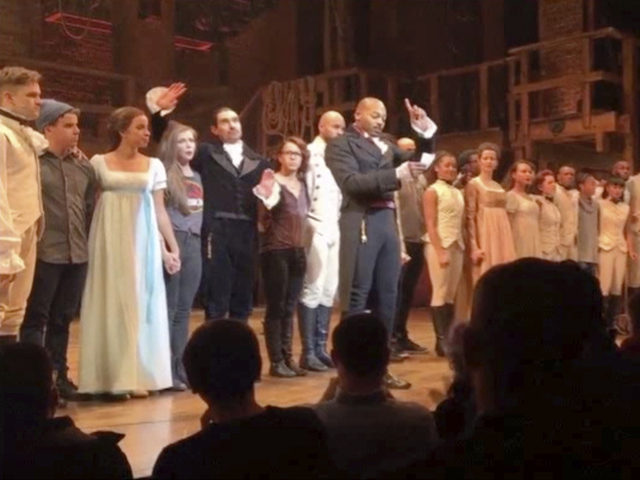 Mike Pence was harassed last night at the theater by the cast of Hamilton, cameras blazing. This should not happen!” Trump tweeted. “The Theater must always be a safe and special place. The cast of Hamilton was very rude last night to a very good man, Mike Pence. Apologize!” he tweeted minutes later. President-Elect Donald J. Trump's "first small batch" of hairspray was air lifted by US Army Chinook Helicopter from his Manhattan Penthouse. The package arrived safely at the White House early Tuesday afternoon. Although the video cannot be authenticated, Donald Trump has been raging over hairspray for nearly four decades. And this revelation came out to an audience who digs coal. "You know you’re not allowed to use hairspray anymore because it affects the ozone. You know that, right?" Trump told a West Virginia audience last May. "They say you can’t — I said, ‘Wait a minute, so if I take hairspray and I spray it in my apartment which is all sealed, you’re telling me that affects the ozone layer?’ Yes? I say no way folks. No way." Trump said. First Introduced April 2015 "H.R. 1777" To amend the Act of August 25, 1958" Commonly known as the “Former Presidents Act of 1958” The "monetary allowance" will be payable to a former President. This Act may be cited as the “Presidential Allowance Modernization Act of 2016”. In General.—Each former President shall be entitled for the remainder of his or her life to receive from the United States — “(1) an annuity at the rate of $200,000 per year; and“(2) a monetary allowance at the rate of $200,000 per year. The annuity and allowance under subsection (a) shall each — “(A) commence on the day after the date on which an individual becomes a former President; “(B) terminate on the date on which the former President dies; and “(C) be payable by the Secretary of the Treasury on a monthly basis. The bill, H.R. 1777, be postponed until the legislative day of December 9, 2016. Donald Trump voted around 11 am Tuesday morning in New York City for himself. He was accompanied by his wife Melania. Trump waved to the the crowd as he entered the polling place in Manhattan. Once inside, reporters asked what the Republican candidate is hearing about early returns. “Heard good things,” he responded. “Just very good in general.” Trump bought a cookie from a young boy to give to Melania before casting his vote, then gave the child a high five. He plans on spending the day inside Trump Tower, according to Fox News. Donald Trump made a surprise stop at a Montgomery County Wawa store on Tuesday. Trump briefly visited the Wawa in King of Prussia. He stopped by after a speech attacking President Barack Obama's health care overhaul. The Republican presidential nominee wandered the store for a few minutes and posed for selfies with a trio of customers. He did not purchase anything. He was joined by staffers, his daughter Tiffany and campaign manager Kellyanne Conway. Trump has made several recent stops in the Philadelphia suburbs, a vote-rich area crucial to winning Pennsylvania.